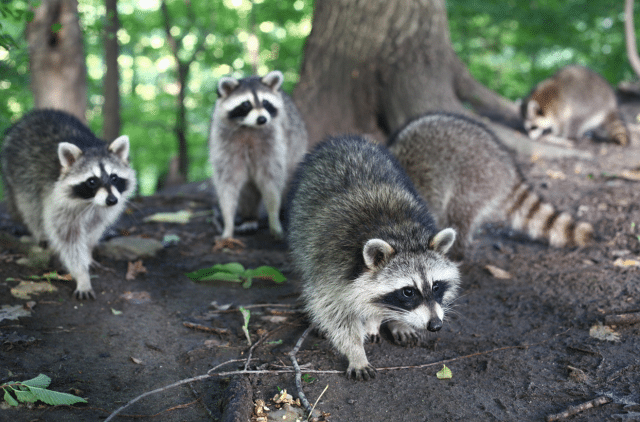 Really all raccoons are ones to watch out for, but especially these ones. Photo by Yana and Denis Bukharov from the Torontoist Flickr Pool. With the very public death of Conrad the Raccoon and John Tory’s declaration of war on “Raccoon Nation,” 2015 proved a tough year for the unpopular urban mammal. But at the start of a New Year many in the raccoon community have ideas of turning things around for their much maligned kind. Recently Torontoist had the chance to sit down with some of Toronto’s best and brightest garbage-eating menaces to hear what they have planned for 2016. The Tech Whiz: “What does everyone in the city want?” Fluffy asks before biting into a discarded orange peel filled with coffee grinds. “To be connected to overturned green bins in their neighbourhood.” I am enjoying breakfast with the tech-savvy raccoon in a commercial dumpster behind his favourite brunch spot on Ossington, and he tells me about his exciting new app: Binr. Using pinpoint GPS and “active pest engagement,” Binr could revolutionize how urban wildlife connect with torn open compost bags, overturned garbage cans and loose banana peels in their city. The quadruped has big plans for his app and hopes that by 2017 it will be on everyone raccoon’s phone. But Fluffy laughs when I call him a disruptor. “Hey, I am just an old-fashioned raccoon who wants an easier way to rummage through human refuse, preferably under the cover of darkness.” In 2016, he’s betting that 100,000 raccoons in GTA will feel the same way. The Actor-vist: “Sadly our media only ever portrays raccoons as garbage-eating menaces,” Screechy says with a sigh as we share a drink from a puddle of rainwater in a chichi Yorkville alleyway. “I am hoping to shift that narrative. Mostly through my own work.” And since 2012 Screechy the raccoon has been doing just that. After a scene-stealing turn in a Stratford production of My Fair Lady, where she broke on stage to chew on the curtain, Screechy has attracted her fair share of attention. Still she knows she has a long way to go: “Of course when there is a role like Rocket from Guardians of the Galaxy, a rare, complex, positive portrayal of a raccoon, it still goes to Bradley Cooper,” she says with a laugh. Fortunately for her growing number of fans she is not giving up on her dream. You can currently catch the four-legged thespian in High Park for her gripping one-raccoon show (Open Heart, Closed Compost) and she’s making her big push into the mainstream next spring as one Toronto’s earliest raccoons, accused of murder, on a special three-episode arc of CBC’s hit series, Murdoch Mysteries.